To those of you who have stumbled upon this blog, welcome to a place on the internet where you can read rambling ravings about a great part of the world called the Adirondacks. I’ll ask my regular readers to bear with me as I do a minor recap about Adirondack Lifestyle. Look for an Adirondack recreation report at the end of this post. A communicator by nature and profession, I started this blog about two and a half years ago as a way to shine a spotlight on the remarkably beautiful area of New York State where I live. My husband, son and I made a lifestyle decision nearly 25 years ago and moved to Lake Placid. It was one of those rare, easy decisions; a result of our desire to live close to nature mixed with a dash of serendipity. As promised two and a half years ago, in this blog I strive to provide useful information and observations for people interested in the Adirondack lifestyle. Here we discuss how to live or play, or do both, in the Adirondacks. For example, it is a little known fact that not everyone in the Adirondacks plays all day long. Some of us actually work and also enjoy that part of the lifestyle. I am a communications and public relations strategist. My consulting company specializes in helping clients tell their story, define their brand and move their markets to action. My primary work involves people and organizations far away from Lake Placid. This I am able to do thanks to the wonders of the internet. I am a licensed real estate agent, so I also help people buy and sell property in the Adirondacks. And I get to enjoy incredible outdoor recreation every day. So, welcome to the Adirondack Lifestyle. It is a great place. If you are a fellow fan of the Adirondacks or just becoming aware, please feel free to join in the discussion and leave a comment. It is already shaping up to be a perfect day for a nice road bike on the Lake Placid Ironman bike course. The area in and around Lake Placid offers splendid road biking opportunities for cyclists seeking stunning views and great hills. The Ironman course winds 56 miles through the Adirondack Mountains and is considered one of the most challenging but beautiful of all the Ironman events around the world. The roads are clean and in wonderful shape. I recommend the ride to cyclists of all levels. 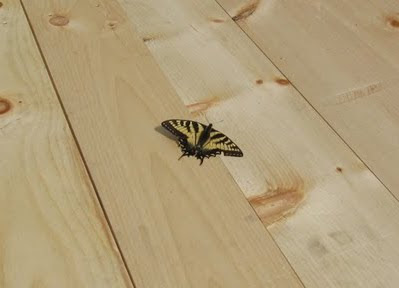 Butterfly on the deck in Lake Placid photograph courtesy of Anya Esonis Reed.